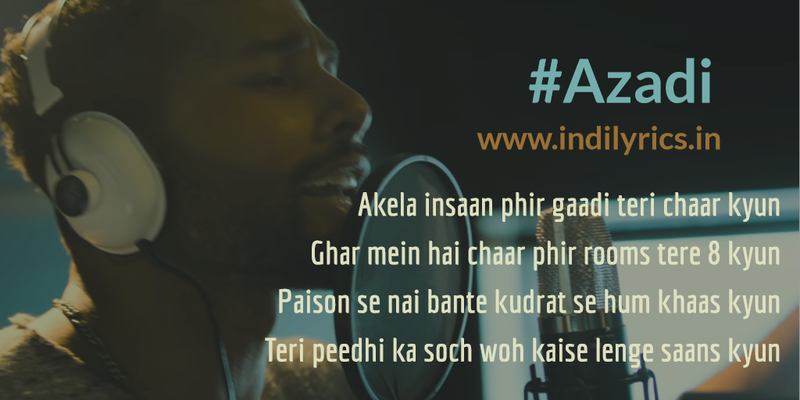 Azadi Full Song Lyrics with English Translation and Real Meaning Explanation from upcoming Bollywood movie Gully Boy, this (LONG) asking for justice Rap song is composed written and sung by both DIVINE & Dub Sharma, the music is available on Zee Music Company. The audio mp3 version of Azadi from Gully Boy is free to download and stream from Gaana, Wynk Music, JioSaavn and other online music portals. The movie stars Ranveer Singh & Alia Bhatt in lead roles. How’ll this country be cleaned? Why are they such useless? Want clean water in house? You’re single then why do you have 4 cars? 4 members at your house then why’s 8 rooms? Why are we great by nature? And not by wealth? Think about upcoming generations, how’d they live? When I have to live with difficulties? How would you face the almighty upon dying? Why you act ignorant even after knowing the wrong?